Anchor for The Autism Channel. Have Asperger's Syndrome -- Married with 2 Teenager Sons who also have Asperger's Syndrome. Co-founded and run C.A.R.E., the Center for Autism Resources and Education, a 501(c)(3) nonprofit agency and developed the "Dramautism Program" with a special education teacher to help children on the spectrum build their communication and social skills through the dramatic arts. Advocate for the Disability Community. Educate elementary students on accepting their disabled peers by performing in puppet shows. Help find homes for abandoned dogs by featuring them on Fox 11 News every Friday morning. Former freelance comedy writer for "The Tonight Show with Jay Leno" and comedy standup performer. 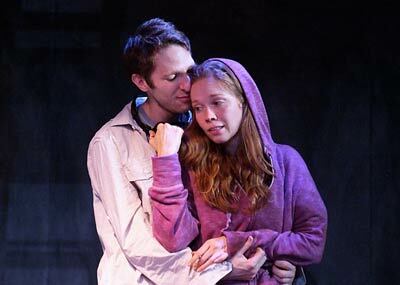 The Fountain Theatre bills “On the Spectrum” by Ken LaZebnik as “not your (neuro)typical love story”…. and it certainly isn’t. It’s more than that…. it’s about a modern-day Romeo and Juliet in love… who both just happen to have autism. (Of course, during Shakespeare’s era, he would have a hard time writing “Romeo and Juliet” with lead autistic characters. The young lovers would have been institutionalized for having autism or left on the side of the cobblestone streets to beg for food or money). “On the Spectrum” is ripe with intensity, complexity, depth and passion, sprinkled with ingenious light-hearted humor. For instance, Mac (the lead character with Asperger’s Syndrome) prepares to ride the New York Subway to meet for the first time his new boss Iris, who is also on the spectrum and has trouble communicating verbally (most of the time, she has to use an augmentative communication device with a recorded voice). His mother Elizabeth is concerned that Iris might do something harmful to him or take advantage of him as Mac is about to walk out the door. Mac responds sarcastically to his mother saying do you actually think she lures young men to her apartment by telling them she has autism??? When he arrives at Iris’s apartment, it’s a total mess – he seriously asks her, “Do you have a fear of laundry?” and starts folding her clothes, which she quickly tosses haphazardly back on the couch. Apparently, she likes to be in control, and her mess helps define her world. Mac (Dan Shaked) lives with his stressed-out, unemployed, photo editor mother Elizabeth (Jeanie Hackett) in a cramped, West Village, New York apartment. Although Elizabeth is not autistic like her son, she holds onto the world of her past by hanging a multitude of yak bells from the ceiling she had gotten in Nepal much to the dismay of Mac. She tells her son that the yak bells remind her of the “best time in her life.” Even though scientists tell us that people with Asperger’s aren’t supposed to get emotional, Mac feels the sting of his mother’s statement. Aspies are, after all, human beings too. Even though he has plans to go to law school, Mac finds a job on Craigslist as a computer graphics designer to upgrade the website, “The Other World,” which was created by Iris (Virginia Newcomb). Ironically, “The Other World” is Iris’s real world, and she rarely leaves her apartment. At the beginning, Iris and Mac haven’t met in person, and only communicate online (their text was was brilliantly displayed in the background of the set). When Mac goes to Iris’s apartment to get the money that is owed him and meets her in person for the first time, the young couple fall in love (having gotten to know each other through cyberspace). While Mac has Asperger’s which causes him to see life in more literal terms, Iris is locked in a world of fantasy spawned by autism. For instance she refers to her apartment in Queens as her “Crystal Palace” and wears a princess costume. Mac is her only hope to get her feet on the ground, and he is more than willing to oblige. According to LaZebnik, “The story is centered around love and finding a place to belong. Based on my own experiences of family members on the autism spectrum, I wanted to explore the issues confronting young adults with autism. I am so pleased to be able to bring more awareness to the Los Angeles community.” (The Help Group Newsletter, Spring 2013). Winner of a 2012 Steinberg/American Theatre Critics Association New Play Award citation and a 2011 Edgerton Foundation New American Play award, “On the Spectrum” shines a powerful light on the obstacles and the successes of people with autism. The acting is flawless and realistic; the story is heartfelt; the dialogue is perfect and the scene design is incomparable. You cannot miss this charming theatrical experience. Get your tickets now at the Fountain Theatre before it ends April 28, 2013. You’ll regret it if you miss it. The Fountain Theatre is located at 5060 Fountain Avenue in Hollywood, California. Performances are Thursdays, Fridays and Saturdays at 8:00 pm and Sundays at 2:00 pm through April 28th. For reservations and information, call 323-663-1525 or visit the theatre’s website at www.FountainTheatre.com. (Not Recommended for Young Children). Unbridled joy! is how Tom (Greg Germann — Ally McBeal, Law & Order: Special Victims Unit, NCIS) describes 16-year-old Mandy (Ashley Rickards – Awkward, American Horror Story, One Tree Hill) who is severely autistic. This also aptly describes the powerful, award-winning motion picture Fly Away. Written, produced and directed by Janet Grillo, the film skillfully and accurately depicts the day-to-day struggles of a single mom trying to raise a severely autistic teenager girl. Tom has a romantic interest in Mandy’s single mother Jeanne (Beth Broderick — The Closer, CSI:Miami, Lost) whom he meets at the dog park. He becomes Jeanne’s mirror as she fights against all odds in trying to create some normalcy in her young teen’s life. Mandy obsesses about airplanes and flying… Jeanne obsesses about her daughter. Every night Jeanne must sing, “Ladybug, ladybug, fly away home…” to help her daughter sleep. But usually, Mandy wakes up from night terrors screaming hysterically, “Bad Mandy, bad Mandy…” and Jeanne must console her. Jeanne has to keep Mandy’s life extremely structured with time-consuming charts to help keep Mandy from sliding into severe temper tantrums. (One time she threw a desk at a classmate.) Exhausted and feeling hopeless, Jeanne places her own life on the backburner to keep “rescuing” Mandy from herself. Ironically, Tom is compelled to rescue Jeanne from herself as she loses her own identity in her daughter. Ultimately, the budding relationship between Tom and Jeanne fails because of the daily trials that saddle Jeanne’s life. Also, the stress of constantly taking care of Mandy without a break, has caused Jeanne to lose her job as well as her carefully controlled universe. Her ex-husband and the principal of Mandy’s current educational placement push Jeanne to place Mandy in a residential school, but Jeanne sees it as “institutionalizing” her daughter and can’t do it. The movie touches your heart and soul even if you do not have a child on the autistic spectrum. There are some light-hearted moments such as the time when Mandy innocently mimics someone in the pizza parlor and says, “Sh–, sh–, sh–!” over and over at the top of her lungs, to the shock of the other customers. As the trailer suggests, parents of children with autism someday might have to realize “when love means letting go” and allowing their young ones to fly on their own. Fly Away is available for streaming on Amazon and iTunes and on DVD.